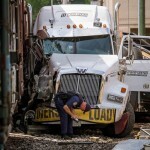 May 14, 2015 – A Norfolk Southern train struck a low-boy tractor trailer at the intersection of Highways 121 and 23 in Johnston around 9:45 Thursday morning, May 14. One witness near the area when the crash happened described it as sounding like a bomb going off while another said he thought it was an earthquake. Early accounts of the accident are that the truck, which was carrying a very large generator of some sort, got stuck on the track at the intersection’s red light. 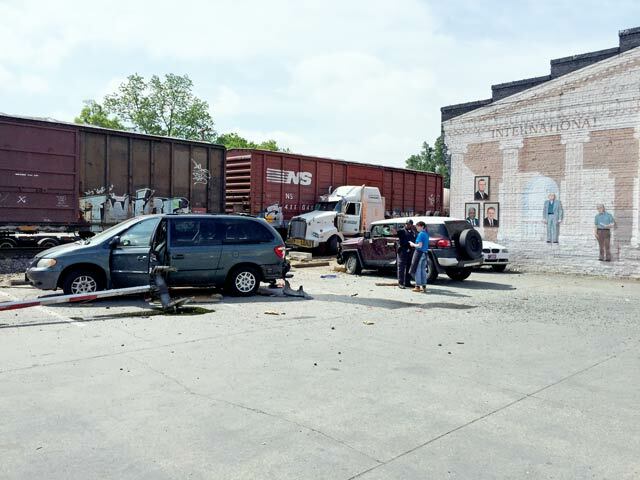 The driver was able to exit the vehicle before it was stuck by the train. 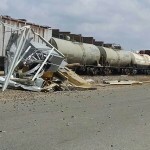 The train dragged the eighteen wheeler about 40 yards down the track before coming to a stop behind Bland Furniture. 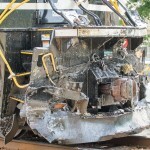 The locomotive and four of the train’s cars did derailed. There was no total derailment, however, and the four cars that came off the track remained upright. 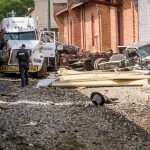 As it made its way down the track, the train and truck cut into the very edge of the backside of the Johnston library. Four cars that were parked in the parking lot beside the library were also dragged by the train into the side of the library as the train continued down the track. 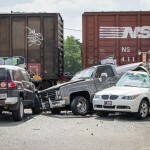 According to Spurgeon, officials with Norfolk Southern, the Department of Health and Environmental Control (DHEC), law enforcement with Norfolk Southern, the Edgefield County Sheriff’s Office, the Johnston Police Department, SC Highway Patrol, and the Johnston Fire Department were all on the scene. 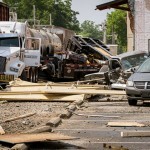 Spurgeon said Norfolk Southern will be taking the lead in the cleanup effort of this accident. As of 2:00 pm, Hwy 121 was still closed and Hwy 23 was only partially opened. Additionally, Jackson Street was also closed. Spurgeon said downtown Johnston “is basically closed,” and traffic is being re-routed away from the town of Johnston. Motorists are encouraged to take an alternate route. The Advertiser will continue to follow this breaking story and report updates as they become available. EMA Director Suzy Spurgeon has confirmed for The Advertiser that the SC Department of Transportation (DOT) has decided to keep closed the intersection of Hwy 121 and the railroad for approximately 3-4 days to allow for repairs to the cross arms. Hwy 23 is open, however, and Jackson Street was expected to be reopened by the end of the day. As to what exactly the train was carrying, Spurgeon stated, “All sorts of things.” A complete list of its cargo was not yet available, but Spurgeon did say there was hazardous material being carried but that the train cars carrying that material were not affected by the crash. Additionally, the total number of train cars being pulled by this train was also not yet available. 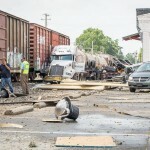 The Advertiser has heard unconfirmed reports that the driver of the truck tried to call Norfolk Southern to warn them that he was stuck on the tracks. However, Spurgeon could not comment on this, saying only that the accident is still under investigation.